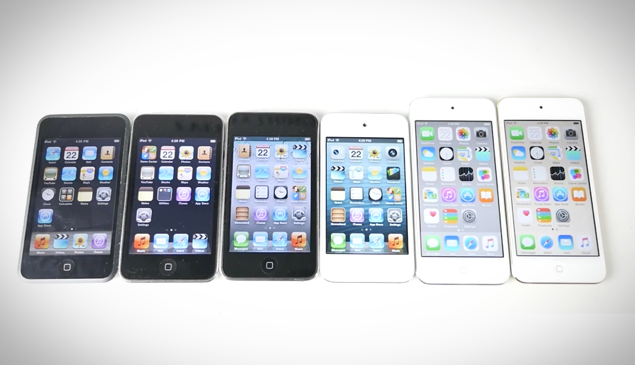 Here’s a video comparing the new 2015 iPod touch 6 with every previous iPod touch Apple has ever released in its lifetime. The 2015 iPod touch 6 turned out to be a surprising but yet expected release, considering that it carries the aesthetics of a device that was released back in 2012 (iPod touch 5) and comes packed with a CPU that lives inside the iPhone 6, making it a perfect blend of old and new in one swift package. All in all, the new 2015 iPod touch 6 is a powerhouse living inside a dwarfed out aluminum shell when compared to today’s standards. And that’s obviously not a bad thing in our books. But the big question is: how does the new 2015 iPod touch 6 compare to all of the iPod touches Apple has released in the past? On paper, the new portable media player by Cupertino is bound to crush its predecessors in one fell swoop, and it actually does, thanks to Apple’s second-generation 64-bit A8 processor coupled with 1GB of RAM instead of 512MB found in the iPod touch 5. So the short answer to that question we raised is: the 2015 iPod touch 6 is the best portable touch-screen media player Apple has ever done till date. In a video published by EverythingApplePro on YouTube, it becomes abundantly clear that the 2015 iPod touch 6 is miles ahead of previous generation iPod touches in the performance department. Launching apps is significantly faster than before, and there’s barely any stutter when moving through different pages of apps or menus. And of course, gaming performance is where the new iPod touch really shines, but honestly, all that power being displayed on a 4-inch screen might be a deal breaker for some. Apple should have at least went with a 4.7-inch panel with the new 2015 iPod touch 6, but it did not, and it makes sense as to why is that so – the company does not want to cannibalize the sales of the iPhone. Hence, sticking to a smaller display sounded like a logical choice. The new 2015 iPod touch 6 even comes in a variety of colors right off the bat as well, giving users even more choice than before. And oh, Apple has tossed in a gold color option this time around as well, so if you’re a gold lover – or fanatic – then you can rest assured that your can have an all-gold Apple product lineup at home. Check out the video below for yourself, and be sure to let us know what you think about the new 2015 iPod touch 6 as well.